She always is professional and does a great job. the service is on time and does what it needs to even though I am not in area or on premises.I trust the company does a thorough job! Customer service was good. Answered all of my questions in a professional and courteous way! Each and every member of the team has been great to work with. It's easy to schedule, change the schedule if needed, and have all of your questions or concerns taken care of. Chad is always here as scheduled on time and does a good job. Terrific and effective service each time! Wonderful service from their technicians to their office personnel! Knowledgeable and informative and answered all question that was a concern to us about the chemicals used. First time I called had an issue with bees they sent someone to service my home on same day. Bees 🐝 were gone the next day! Checked out prices for year round service since I like the work done & my service rep Chris German was EXCELLENT ‼️Plus the price was very reasonable compared to service I had at my other home. Found out that my current home home before I purchased it was serviced by Paramount wish I had known would have started service earlier THANKS FOR YOUR EXCELLENT SERVICE ‼️. yes I am happy with my service, the yellow jackets are gone - so far! But this weather may have them hiding now! I haven't seen them since Chad put the powder down! Thanks Chad for coming back out and taking care of the bee's! Appears that the job was performed satisfactorily. Love Paramount Services. My tech is professional, thorough and nice. Would recommend them in a heart beat. Home Paramount was very professional from initial contact through to the completion of the job. Would highly recommend for any one in need of their services. I have had great service always at one of my addresses that is serviced. The apartments that we have have not always been serviced the best. We now have Mike Fox and he is terrific and has wonderful communication with us. I love all aspects of the service except only being called just a couples days from a scheduled time. Sometimes I cannot rearrange my schedule so I end up only having the outside treated or having to call. Home Paramount coordinating the timing of my appointment, so I did not sit around waiting for them and miss too much time at work. The technician was polite and answered all my questions. I had a lot of questions. The service man was very helpful. Everything was handled to my satisfaction. All your technicians are so nice and knowledgeable. Love the flexibility Home Paramount provides and this is a very friendly group of professionals. The product (mosquito and tick treatment) has been very effective to date. I look forward to the next installment because the treatment has managed to eliminate mosquitos and really impacted the gnat population as well (although not entirely). Excellent service. The technician, Travis, who comes out to treat the site does a very good job, is thorough, and always checks in to let us know he is here. Thank you so much for the good service. We appreciate it. Friendly service and no complaints with them at all. I know I can call if we have any problems. Very happy with the service of our new representative who has been here maybe three times, but does a wonderful job and is very friendly, and also knows what he is doing. Thanks. Friendly, dependable, concerned with my needs and problems. Your representative, Toni is always polite and professional. You folks are all great! Office staff and field people all do a great job. Thanks for taking care of our bugs and critters, but mostly thanks for taking care of us. Even though Dennis is gone, my new rep was helpful and personable. We have never had any problems or concerns with the service we have received from your company. We would gladly recommend your company to anyone who needs your services. Your technician, Chad is very conscientious and cares about his work. Bug free and happy customer. Always professional and courteous service. Always on time. 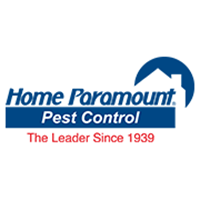 We have been happy with Home Paramount during our many years of association.